If there is one principle true for all great art, it is that repeat visits reward with new insights. This is as true for great pop records as it is for great paintings, great books and great films. Case in point: Bob Dylan’s sophomore album Freewheelin’. I just re-listened to this LP for the umpteenth time (which means that I’ve heard this recording I don’t know how many times over the past four decades) and it never fails to offer something new. In Dylan’s expansive catalog, I’m hard-pressed to name another record better than this one. And I’ve tried them all. Freewheelin’ was the follow-up to Dylan’s eponymous 1962 debut — an album that sold so poorly that Dylan was nicknamed “Hammond’s Folly” by execs at Columbia Records. But whereas his debut showcased Dylan in full Woody Guthrie mode (and still making wild claims about a mythical childhood in the Southwest or raised by wolves in the Black Hills of the Dakotas), Freewheelin’ is where Bob Dylan actually finds his voice. It’s here that he puts the finishing touches on his persona by adding touches of James Dean and Marlon Brando to Guthrie 2.0 and Ramblin’ Jack. And regarding the LP’s most famous song… Just as some “true” Beatles fans identify themselves by denigrating Sgt. 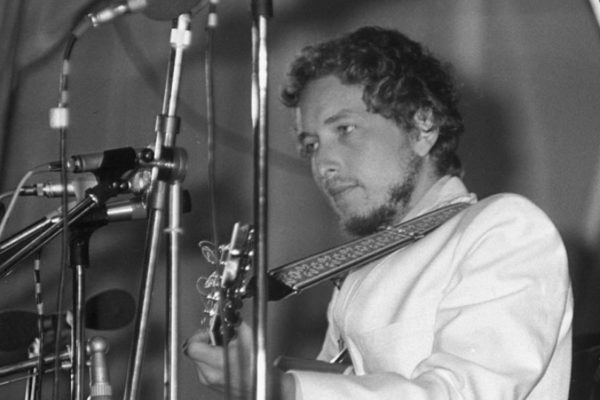 Pepper’s Lonely Hearts Club Band, Dylan elitists tend to dismiss “Blowin’ in the Wind.” In truth, “Blowin’ in the Wind” rates among the greatest American songs of the 20th Century. I imagine it gets the short shrift now because it’s joined the ranks of anthems like “Amazing Grace” and “We Shall Overcome,” yet on an album of major and minor masterpieces, “Blowin’ in the Wind” really does remain the jewel in the crown. But the rest of the album has many high points: “Girl of the North Country” has near-perfect lyrics; “Down the Highway” is classic country blues; and “Bob Dylan’s Blues” plays the essential role of releasing some air from the profundity balloon. As for “A Hard Rain…,” yes, it’s based on an old Scottish ballad, but it stands there, with one foot in the 17th Century and the other in the 20th. It encompasses Kerouac, Ginsberg, and the Beats and who knows how many other references and when it first was released people were absolutely dumbfounded by it, just like they must have reacted to hearing Charlie Parker for the first time, or Bill Monroe. And then there’s the album’s amazing cover: a simple photo of Bob and his girlfriend walking down a winter street in the Village, which somehow manages to encompass the vague and uncertain concept of “freewheelin'” that gave the LP its name. To be freewheelin’ seems to have something to do with your relationship to the future. If the defining characteristic of what is now called “THE SIXTIES” was an ability to imagine a future as something other than the simple extension of the present then the sixties start here, in those boots, those jeans, that jacket and this amazing album.